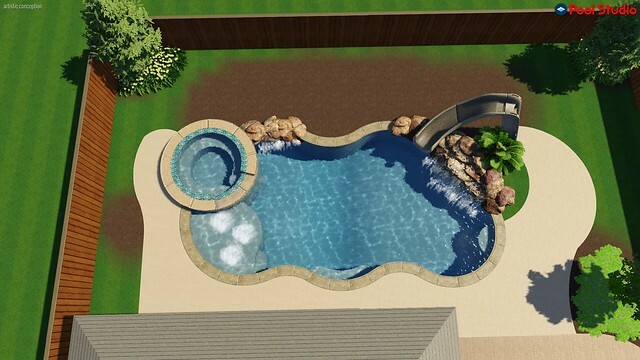 We are in the process of meeting with Pool companies to build a SWG pool in League City. So far we have 2 quotes but are leaning toward the 2nd. We want a spa, waterfall and the option to add a slide (typhoon) later. 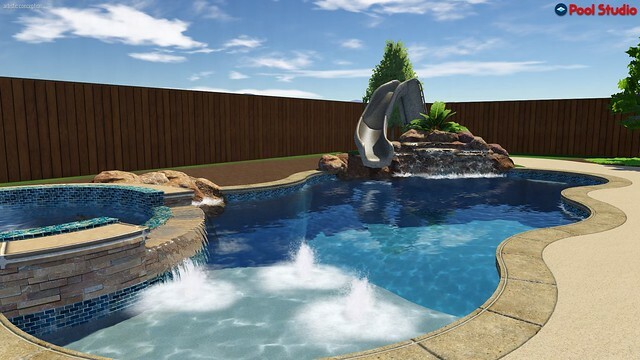 Here is the 2nd pool builders design (we had him change some things and delete the landscaping for now). Does this pool equipment look ok? Do I need to seal the travertine and our flagstone patio? The equipment looks good to me. Other should be along to give it an extra look as well. 9-11 return lines??? That is a LOT of returns. Do you have any idea where they will all go? I LOVE the design! It will be fun to watch them put the waterfall together. It will be interesting to see how the build it with the slide in mind for the future. You should not need to seal you flagstone and such. It can cause it be to slippery so there is that to think about. That looks awesome! I am new to the site as well, so I really have no input since we are still waiting on our permit , but I love your design!! Making me wish we put a slide in our design! Can't wait to see the build! Thanks, I'm not sure about the return lines. I'll have to ask the PB. I think if we do seal it we'll just do it ourselves. The people we sold our playset to are supposed to come this weekend and get it and then we'll be ready to start building. We had the last PB come out Monday so we should have a quote from him soon. Hopefully we'll get this pool in before summer. Wow. That is awesome. Very nice. Can I ask what a pool like that cost to build from scratch?? Wow, that is really reasonable. Here, you couldn't touch that for 65K. Good luck on your project, and can't wait to see it progress! Thanks, we just signed the contract! I'm hoping it doesn't take too long to get the permits in. We are moving to League City next month --- would love to know who you used and what your final results were!!!! that's it! man i got to move down south. you guys build pools for nothing! that is an awesome awesome design! awesome! i would jump all over that for 50! 9-11 returns the whole pool will be like a spa!